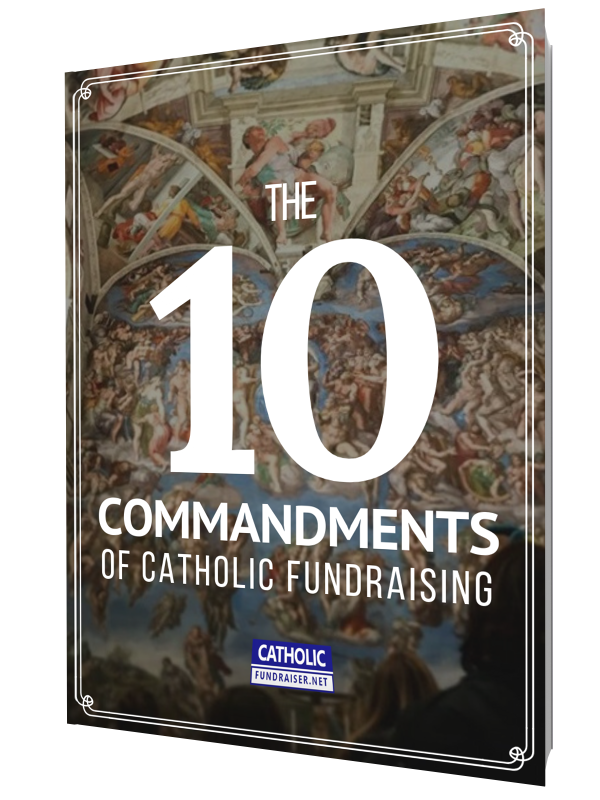 New donors can be the catalyst for your Catholic non-profit or mission. But finding donors can be overwhelming for many of us. Based on years of experience launching successful fundraising campaigns, today I am sharing with you the three steps that will take you from drawing board to raising funds in no time. In this article, you are going to learn how to save time when it comes to finding donors and use a method for building a sustainable approach to raising funds. This step is both easy and incredibly difficult. If you’ve never built a website, you might struggle with the idea of diving into the technology. If you do have a website, you might think to check this step as complete. In both cases, I recommend you approach websites with a new perspective. You must constantly learn how to make your mission’s message as clear as possible through your website. This means regularly updating your site. Most of us get overwhelmed by the technology side of a website, but this isn’t what you should be worried about. The technology constantly improves without you or me doing anything. There’s always a new upgrade, a new template, a new tool to make websites easier. So the technology, visuals, and user experience always improve, regardless of what we do. Instead, you should worry about getting your message as clear as possible. Get to work today to make sure your paragraphs, sentences, and photos tell the story you want to tell. Check out my article on how to make a Catholic website from scratch. Plus, you can make a website for less than $100 using Wix, Squarespace, or WordPress. Once you have step one moving forward, you have to get people to visit your website. To do this, you must understand that people do not visit your website unless you constantly ask them to visit it. The important word to remember is “constantly”. a sign in front of your off-ramp telling people they should come, they rarely well. Worse, they will forget you are even there. The best way to drive traffic is to use ads. Don’t have any money for ads? If you are a non-profit, it’s your lucky day because Google offers you $10,000 of free advertising a month. That is equal to a $120,000 grant, every year, for as many years as they keep allowing this. I wrote an article explaining how to enroll in the Google Grant program. As an alternative, you can use CatholicAdNet which specializes in displaying online ads on Catholic and Christian websites. The phrase ‘passive income’ is quite trendy at the moment. It means generating earnings while not doing much work. Sounds nice, right? Well, I have coined the phrase ‘passive fundraising’ which means generating funds with significantly less work than the old-fashioned fundraising tactics. The way you do this is by completing this third step: making a funnel. A funnel simply means keeping in touch with people over an extended period of time in order to share with them your mission’s journey. This is paramount because people do NOT give simply because you ask them to give. People give because they want to give. In order for them to WANT to give, you must share your mission’s story, excitement, and journey with them on a regular basis. The best way to do this is via email and videos. I say this because email is inexpensive and highly effective in sharing messages. Video too costs next to nothing to upload on the internet. I wrote an article detailing why email is so effective for Catholics here. Also, I wrote another article explaining passive fundraising here. While setting up the three steps may sound daunting, I want to encourage you to start today by sharing with you the results of three Catholic organizations. Here are three examples of Catholic organizations that have used these three steps. I have not added their websites in order to keep their financial details confidential. If your Catholic cause is much larger than these three, you might not be impressed by these numbers. But consider the possibilities of using these three steps with a greater number of visitors. If you had 100,000 visits to your site per month, and you had a funnel that produced $1 per visitor, you would raise $1,200,000 per year. Consider the opportunities your cause could pursue because of these funds. Every year, you could raise this money, like clockwork. That’s passive fundraising. Question: Which step are you currently on?